Whether it's a steady source of income, capital appreciation to grow your nest egg, or both, these three dividend stocks look like smart choices. If you're retired, or getting closer, dividend stocks can be a very appealing investment. Not only can they keep you exposed to the long-term capital growth of stocks, but they will pay you along the way. This extra income can help make ends meet in retirement, while also making it easier to ride out the downturns that make stocks more risky in the short term. After all, there's a lot of evidence that as long as you can ride out the short-term declines in stocks, the long-term rewards can more than make up for the risks. To help you find a few great dividend stocks to add to your diversified portfolio, three Motley Fool investors put together some of their best ideas. Below, they explain what makes Brookfield Infrastructure Partners LP (NYSE:BIP), Chubb Ltd. (NYSE:CB), and Pfizer Inc. (NYSE:PFE) ideal dividend stocks for retirees. Dividend stocks can help you meet your retirement income needs today, and grow your nest egg for tomorrow. Image source: Getty Images. Jason Hall (Brookfield Infrastructure Partners): Retirees have to protect their nest egg for short-term needs, while continuing to grow their assets to provide for long-term needs. And I think Brookfield Infrastructure Partners is a near-perfect investment to help deliver both steady income and long-term growth. BIP Dividend data by YCharts. And it's not just dividend growth that should make Brookfield Infrastructure appealing for retirees. Its business model makes it very resistant to recessions or inflation. Brookfield owns and acquires energy, water, freight, transport, and telecommunications infrastructure assets around the world. These assets often are monopolies where they operate, have very high financial and regulatory barriers to entry, and generate steady cash flows across every economic environment. Brookfield has also structured many of its revenue streams from these assets so that it can adjust prices for inflation. Maybe the best part is that infrastructure spending is set to grow substantially in coming decades as the global urban population adds billions of people. This will provide a lot of opportunity for Brookfield's excellent management team to allocate capital into new growth opportunities, keeping that dividend growing for years to come. As a master limited partnership (MLP), Brookfield Infrastructure isn't an ideal holding to buy in a retirement account. But it's a perfect investment for retirees to own in a taxable account to generate many years of steady -- and growing -- income. Jordan Wathen (Chubb Ltd): Retirees shouldn't cut corners on business quality in the pursuit of yield. 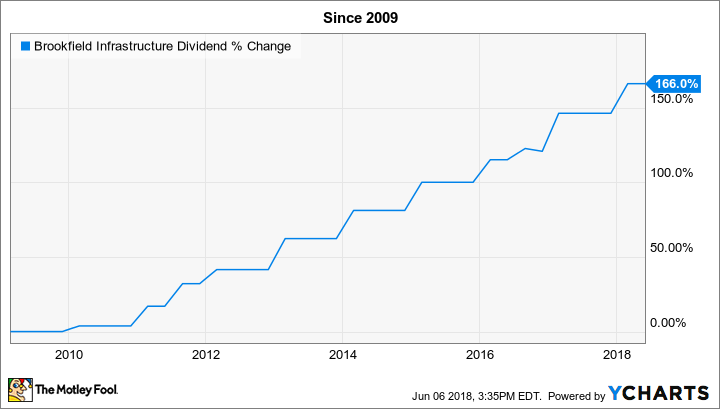 As one of the best insurers in the business, Chubb throws off an attractive 2.2% dividend yield that should grow at a respectable single-digit clip for years to come. The hallmark of an extraordinary insurer is a consistent record of taking in more in premiums than it pays out in losses and operating expenses. On that basis, few can match Chubb's performance. Its five-year average combined ratio last stood at 89.1%, nearly 10 percentage points better than its average competitor in North America. Chubb competes primarily in commercial insurance lines, which drives its above-average underwriting performance. Whereas most personal insurance policies use standard forms and contracts, commercial insurance is often custom tailored. That makes it more difficult for commercial clients to shop around for the lowest price, and it explains why specialty insurance companies have historically performed far better than insurers that compete in segments of the market where policies are mere commodities. I see Chubb as a safe, defensive dividend pick for any income portfolio. With shares trading at about 13 times earnings estimates for 2018, the stock trades well below the multiple of the S&P 500 (17 times earnings), and boasts a yield about 20% higher than the average large-cap stock. A lower-than-average valuation and higher-than-average dividend yield set the stage for impressive returns for shareholders. Sean Williams (Pfizer): Ideally, when retirees buy a dividend stock, they want the highest yield possible with the lowest risk imaginable. Trying to balance income and risk can often be a challenge. But that's not something retirees would necessarily have to worry about with big pharma Pfizer. Though the company behind the best-selling drug of all time, cholesterol-lowering medicine Lipitor, is well past its growth prime, Pfizer still has a few tricks up its sleeve to create value for its shareholders. To begin with, Pfizer is well past its early decade "funk." Or, in layman's terms, it's well past the patent cliff. Earlier this decade, Pfizer ran into serious issues when a number of key therapeutics hit the end of their exclusivity period, causing Pfizer's annual sales and profits to plunge. Years later, while those same legacy products still struggle against generic medicines, Pfizer has a new line of branded medicines ready to pick up the slack. Speaking of these core medicines, perhaps none has been more impressive than advanced breast cancer drug Ibrance. During the first quarter, Ibrance tallied $933 million in global sales, up 35% on a constant-currency basis from the prior-year period. Ibrance -- along with blood-thinner Eliquis, inflammatory drug Xeljanz, and cancer drug Xtandi -- has done the heavy lifting for Pfizer and ensured that its legacy drugs haven't weighed too extensively on sales growth. Pfizer also has an impressive lineup of experimental therapies waiting in the wings. As of Jan. 30, the company had 87 clinical-stage programs, including 10 that were in the registration part of the process (i.e., a new drug application filing, or active review by the Food and Drug Administration). That's more than enough ways for Pfizer to swing for the fences in the years to come. Ultimately, what seniors get with a company like Pfizer is a product that's inelastic. Since we can't choose when we get sick, or what ailment we contract, there's a steady-to-growing level of demand and pricing power for the products that Pfizer offers. Also, with lawmakers unwilling to sink their teeth into drug-pricing reform, Pfizer has little to worry about when it comes to losing its pricing power. This means Pfizer's current yield of 3.8% is very safe, and, if anything, likely to increase over time, keeping long-term shareholders happy.